FOLLOWING the road traffic collision on the Vianstown road (Tuesday 26 Feb) around 9am in which 12 young school children from Knockevin School in Dowpatrick escaped serious injury, police are keen to remind motorists of the importance of making sure their passengers wear their safety belts. “We are extremely fortunate that the collision yesterday resulted in minor injuries and shock only” said CI Deirdre Bones, Down District Area Commander. “As it appears the children were properly strapped into the bus, and I believe this is the reason that more serious injury or even death was averted. The overturned Knockevin School bus with the white van behind which were involved in a collision on the Vianstown Road near Downpatrick. “In a crash at just 30mph, an unrestrained child can be thrown forward with a force 30 to 60 times their body weight. This means that they would be thrown about inside the vehicle, injuring them and quite possibly seriously injuring or even killing other passengers. They are also likely to be ejected from the vehicle through one of the windows. * Children under three years MUST use an appropriate child restraint in any vehicle – the only exception being when travelling in a taxi, where they must use an adult belt, if no suitable restraint is available. * In vehicles where seat belts are fitted, children from three years and up to 135cms in height or 12 years of age MUST use the appropriate child restraint. The only exceptions are in respect of taxis, unexpected short journeys and where two fitted child restraints prevent the fitting of a third. Anyone who would like further advice can contact the local Neighbourhood Policing Team on 0845 600 8000. Ulster Hospital – 8 children ( 3 females, 5 males, aged up to 19). One male was kept for further investigation, and all others discharged. Downe Hospital – 5 children ( 3 male, 2 female), 2 adults (1 male, 1 female) are all discharged. The scene of the Knockevin School bus crash on the Vianstown Road/Bonecastle Road junction. 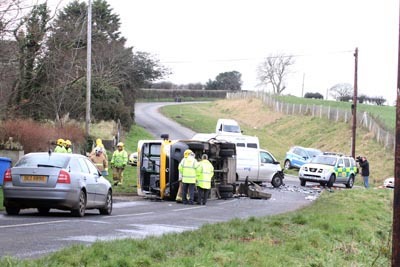 Down District Council Chairperson, Councillor Mickey Coogan has expressed his relief that no lives were lost when the bus carrying children from Knockevin Special School crashed and overturned at the junction of the Vianstown and Bonecastle Road. 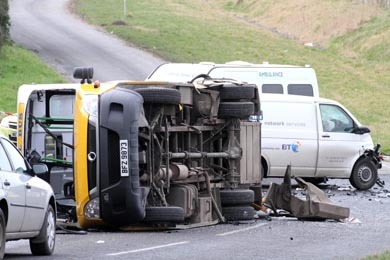 South Down MP Margaret Ritchie said just after the crash: “I am relieved to receive confirmation from the PSNI none of the adults or children involved in the accident this morning were seriously hurt. I understand that they are currently receiving attention at the Downe Hospital. 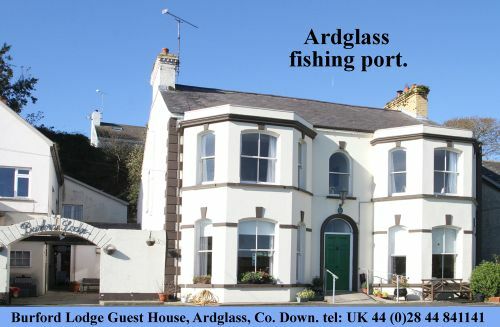 “I understand drivers on the Vianstown Road stopped to assist the children. The community response to this accident is to be commended. South Down SDLP Assembly Member Seán Rogers also voiced his support for those injured and said: “I understand the bus was carrying 12 passengers who are pupils of the nearby Knockevin Special School. Initial reports state that the Children are being treated for shock but have no major injuries. Sinn Féin Downpatrick Councillor Eamonn Mac Con Midhe said he would like to send his best wishes to all those caught up in the road traffic accident on Tuesday morning. He said: “When a bus carrying 12 children aged between four and twelve years old along with three staff members overturned at the junction of Bonecastle / Vianstown Road. The bus was going to Knockevin School and although it is believed there are no serious injuries to anyone , this would have been a frightening experience for everyone on the bus. “I would also like to praise the local firefighters for being on the scene within minutes of the accident happening and also the police and ambulance crews and parademics along with local neighbours who came out to help in any that they could. Down District Council Downpatrick Councillor Cadogan Enright said: “The route the bus was taking was from the Western approach into Downpatrick along the Vianstown Road, and was taking what has become an ‘unofficial ring-road’ around the town that has grown up thanks to the failure of the last 25 years to tackle congestion in Downpatrick. “They were travelling up towards the Bishops Brae in the town and onwards to Knockevin School. This route is not a ring-road but a series of country roads that have fallen into use by town residents as a ring-road around the town to avoid the congestion morning and evening in Downpatrick. “The real cause of this accident in my opinion is the failure by the Roads Service to bring forward relief roads in the Downpatrick and Ballynahinch areas as they have done for every other major centre of commuting into the Belfast area. This is driving large numbers of people onto unsuitable country roads in both these towns.